The effects of a car accident can range from disruptive to life-changing. Even if you not require weeks of medical treatment, as many of our clients do, there is a strong possibility that you will endure several weeks of back, neck, and head pain. The human body is simply not built for the violence of an automobile collision. Unfortunately, insurance adjusters are employed to ensure that you do not make a complete financial recovery from the at-fault driver’s automobile insurance company. They usually offer settlement values which are significantly less than what you would be entitled to in court. The Wake Forest car accident attorneys of Maginnis Law, PLLC are experienced in handling automobile accident cases and can help you both negotiate with the insurance company and, if necessary, litigate. Our lawyers will work diligently toward obtaining the fair personal injury compensation to which you are entitled. We may be reached at 919.480.8526, or you may visit our contact page to submit a new case inquiry. (7) Punitive damages (when the defendant’s conduct is gross or willful and wanton). The Wake Forest car accidents attorneys of Maginnis Law, PLLC offer free consultations for all personal injury cases and are happy to discuss with you a reasonable estimation of your damages. Our personal injury matters are handled solely on a contingency basis so that you pay no attorneys’ fees unless you make a recovery. If we do not feel we can add value to your case, even after accounting for the attorneys’ fees, we simply advise you how best to handle your case on your own. 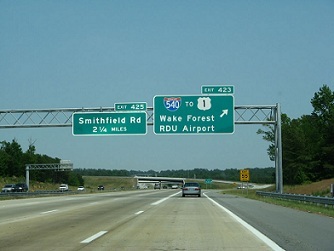 If you are involved in an automobile accident in Wake Forest, North Carolina, including injuries caused by an accident on or around U.S. Highway 1 or N.C. Highway 98, contact the civil litigation lawyers of Maginnis Law, PLLC at 919.480.8526. You may also use our contact page to submit a new case inquiry to our attorneys; you will typically receive a response within the day.